Are you looking for something fun to do this Halloween weekend? Pinecrest Parks & Recreation has the answer! 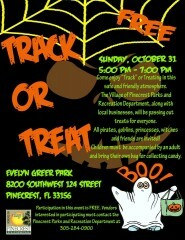 Track or Treat will be held on Halloween day at Evelyn Greer Park. Miami-Dade Monster Merchants will be set up around the track providing treats to all ghosts, goblins and friends. What a great, safe alternative to traditional trick or treating. Please bring a trick-or-treat bag! There will be a bounce house and haunted house. Domain of Fears will take place both Saturday and Sunday. Enjoy an event of scary fun-fear where the killer cupid and his minions await your arrival! Travel through a scary graveyard, the gypsy’s tavern, the castle of hungry vampires, a torture chamber, a portal and killer cupid’s love nest. This event is appropriate for all ages! I’m guessing that means that even chickens such as myself can go without fear of really being scared to death. This entry was posted on Wednesday, October 27th, 2010 at 9:06 am	and is filed under Entertainment, Pinecrest. You can follow any responses to this entry through the RSS 2.0 feed. Both comments and pings are currently closed.